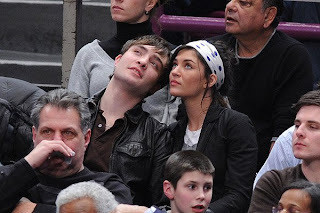 Seems the rumours of 'Gossip Girl' co-stars Ed Westwick (Chuck) & Jessica Szohr (Vanessa) hooking up *are* true. Here's the proof! I don't know how I feel about this, in the show I love Chuck and hate Vanessa, but in real life I know they're different people. Hm, I don't know. Did hear Serena and Dan are real life engaged!! Cute. Blair dates the guy who played the rich gambling friend-dude that stole Chuck's autographed baseball in season one. Seems they do fish off the company dock on the 'Gossip Girl' set! Um yeah. Hate Vanessa and love Chuck. I'm going with I don't like this even if it's real life. I'm not into reality. Pays to work on a set of beautiful people then. That guy was hot. I'm with you LL, reality isn't half as interesting.